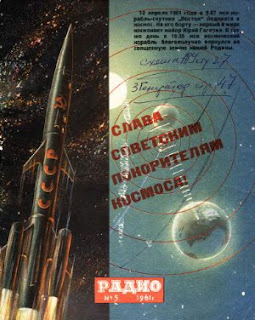 This is what Russian leading radio magazine "Radio" cover did look like in May, 1961 after man in space. If we could go back in time to April 12, 1961, we should turn our radions on 143.625MHz VHF and possibly on 20.006MHz shortwave. The somewhat naive representation of the space vehicle is not something the editor has put there for fun. The actual appearance of the Vostok-1 spacecraft was not revealed until the year later. The excellent article about the secrecy around the early space flights can be found Here.